This Cream Lace Maxi Dress with Tulle Detail is absolutely stunning! This maxi features a beautiful Cream color, lace detailing and a tulle skirt. Feel like a princess wherever you wear this maxi dress! this dress fit amazing. I'm 5'6" 140 lbs and ordered a large. Thought I could always get it taken in if needed but it's perfect. Absolutely love it!!!! Fit just right and is a beautiful dress! I ordered this dress for my Bridal Shower. It's even better in person than online. It's simply gorgeous! I cannot wait to wear it!!!!! I'm 124lbs and 5'1 and a half, I ordered a Medium and a Large. The medium was perfect. I needed so much cut off the bottom because I'm so short & I had the straps taken in a little bit to make me feel more secured, but everything else fit perfectly. Looked just like the pictures! The dress is exactly like the pictures and the small fits perfectly!! 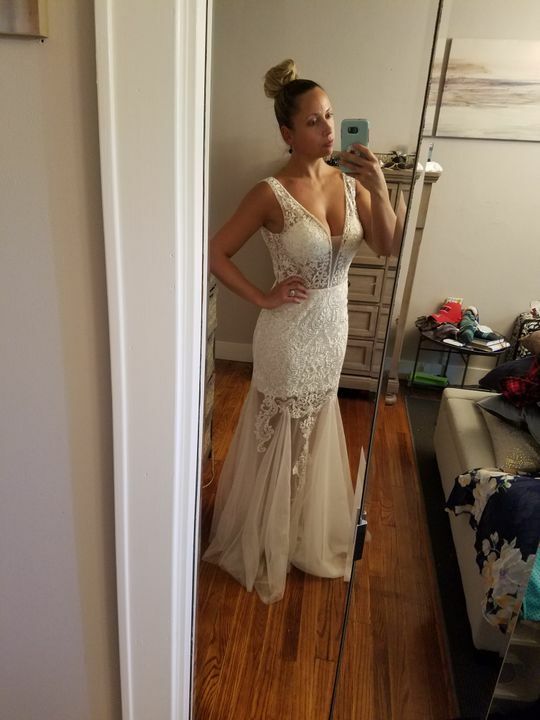 Haven't worn it yet just tried it on but it is a great dress!